Rattlesnakes are a common reptile in the wild and they can be deadly when they strike. In June 2016, a short hike to a local lake turned tragic when a 71-year-old man was killed following a sudden bite from a venomous rattlesnake in the Santee National Wildlife Refuge near Columbia, South Carolina. Rattlesnakes are known to usually avoid people and human attacks are rare where they inhabit. But they can happen. According to The Herald, Conservationist Wayne Grooms was hiking with a friend when he was struck by the rattler in his lower left leg. Grooms eventually collapsed and died a mere 15 minutes after the bite, reports the Clarendon County Coroner’s office. While not all rattlers are venomous, this Western Diamond Back at White Sands National Monument is. Photo courtesy NPS. While rattlesnakes inhabit various regions in the Southwest, they can also be found in the many winter snowbird destinations in the Southeast, as well as the Northwest and other parts of the country in the warmer months. 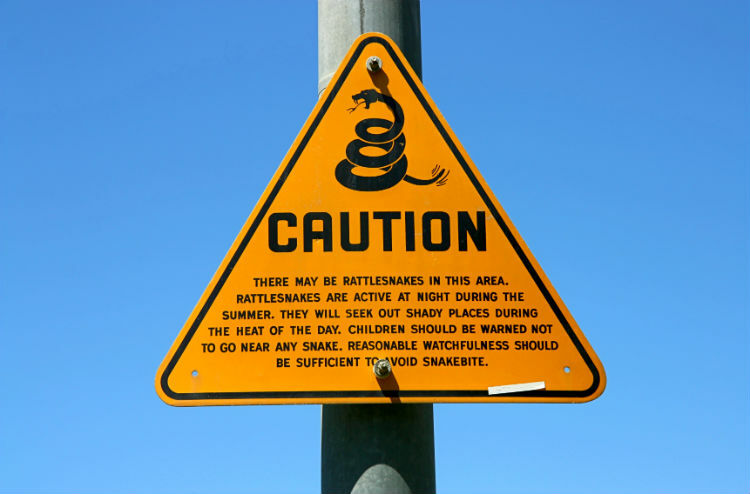 When visiting a new, unfamiliar area in your RV it’s vital to know if you are in fact in rattlesnake country. Although rattlesnakes are known to usually avoid people and human attacks are rare, they do happen. If you see or hear the bone-chilling sound of a rattlesnake, avoid it completely and clear the area immediately. In another instance, from a report in the Pittsburgh Post-Gazette, Russell E. Davis was camping in Beaver County, Pennsylvania in July 2015. He was bitten by a rattlesnake while putting wood on a campfire. After alerting his girlfriend, they drove to the hospital when Davis began experiencing severe breathing problems. When they stopped at a local business for help, an ambulance arrived shortly after and paramedics began CPR. Davis died a short time later of a full cardiac arrest, before arriving by air to a Pittsburgh hospital. While some bites can be fatal—depending on the species—many are not. According to the U.S. Food and Drug Administration, approximately 8,000 people encounter venomous snake bites every year, with 10 to 15 attacks resulting in death. 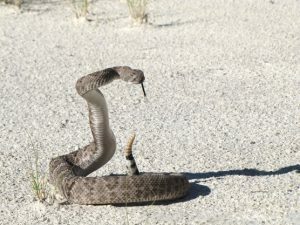 In fact, Kirsten Macintyre, Communications Manager for the California Department of Fish and Wildlife, explains 25 percent of rattlesnake bites are dry, meaning no venom injects into the human body. Be aware of the bite from rattlesnakes. Call EMS or seek medical attention immediately. Remain still. Movement can spread venom through the body. Keep the injured body part motionless to just lower than heart level. Stay warm with blankets, jackets, sweaters, etc. Don’t eat or drink anything. Pay attention to local signs and follow appropriate precautions. Rattlesnakes are not only in the wild. 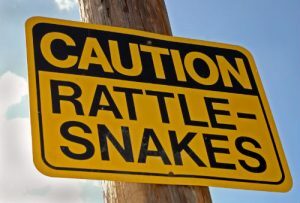 In September 2014, a 91-year-old man was struck by a rattlesnake while outside of a grocery store in Quartzsite, Arizona. The Havasu News reports he was walking into the building and was bit by an adult Western Diamondback, just above his ankle. The man immediately went to the local hospital where he responded well to treatment. Never go barefoot in the wild. Wear boots over the ankles and long, loose-fitting pants. Avoid tall grass, weeds and heavy underbrush where snakes rest during the day. Be careful climbing rocks or gathering firewood. Always shake out sleeping bags before use. Don’t grab sticks or branches in lakes and rivers. Rattlesnakes can swim. Always have someone in the outdoors with you who can assist in an emergency. Never handle a freshly killed snake as it can still inject venom. Teach children to leave them alone. Nonetheless, in the event of a bite, which can happen in mere seconds, the symptoms of the venom develop soon after. While there are several species of deadly rattlesnakes (as well as other poisonous snakes) throughout various regions of U.S., if you think you have a rattlesnake bite, play it safe and seek medical treatment right away, regardless of your location. But in the grounds of the museum, where there are several exhibits you will probably want to take a look at, I came within ten feet of two eight foot long rattlesnakes. And it is easy to not immediately recognize them, as they are well camouflaged for the terrain. I doubt they would attack as they didn’t seem scared of visitors. They have no doubt seen plenty of us over the years and realize we are not a threat. Nevertheless ……………. THE BLACK BAND AROUND THE TAIL JUST BEFORE THE RATTLERS INDICATES THIS RATTLER IS A MOHAVE RATTLER. Good advice here. Hiking pipeline right of way in the Poconos in 1973 I walked up on rattlers twice that year. Heard them, didn’t see them slither away. Rattlesnakes in areas of Texas are eaten by wild hogs. The snakes have learned to not rattle as it attracts the hogs so you can’t depend on the rattle sound. At Capital Reef NP I was hiking some hills. As I came around a corner, I heard aloud rattle-snake warning. Fortunately for me, it was a small rattler and was slithering away as I came upon him. I have two take aways: the rattle was loud–just like you hear it on TV shows; second, had the rattler wanted to stay for a bite, it would have had me because there was not enough time between my rounding the blind corner and hearing the blood curdling rattle. I wasn’t using hiking poles, but I will next time! 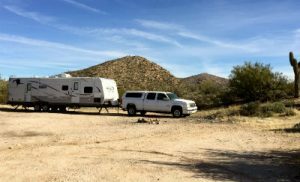 You might consider using a rough rope around your RV to keep snakes out. Snakes do not like those types of rope and will not crawl over it. Are you saying that rattlesnakes will crawl up around or into my RV??? OMG! How am I supposed to keep them out? Aside from rough rope, of course. You might just have convinced me to stay home…..
4) If wildlife viewing is desired, hike to the viewing area, make sure the area is clear of unwanted wildlife (snakes especially), then settle down quietly to allow desired wildlife to come back to the viewing area. A pair of hiking sticks cost about $20. Placed ahead with normal arm swing they can help protect your legs because the pole is the first object a snake will encounter. They can also offer a defensive distraction should you accidentally get too close. Snake boots are high leather boots that protect the lower leg from most bites, but they are heavy, expensive, and hot for most snake climates. Snakes are cold-blooded animals, they raise their body temperature by lying in the sun or lower it by crawling into the shade. Their body temperature changes as it adapts to the temperature of its surroundings. During winter snakes in warmer climates often enter what’s referred to as brumation, slowing down their metabolism, while still remaining somewhat active, ready to take advantage of a sudden sunny day or easily captured food animal. Snakes like sunlight, but too much summer heat will typically cause them to seeks shade from trees, rocks, Most localities have what has been termed “snake season”, when snakes seem to be the most active. Luckily for snowbirds the winter is the time of year when snakes are least active. As a kid I remember just about every outdoor magazine sold snake bite kits. Today these kits are considered dangerous and ineffective. The consensus today is that a “snake bite kit” is worse than doing nothing. The most effective defense is to take your time and plan a path with the best visibility of the terrain, trails are much safer than heading off through vegetated or rocky areas.